The Prime Minister Dr.Manmohan Singh was 80 yesterday. He is the second oldest Prime Minister the country has had. Morarji Desai was the oldest. He became Prime Minister in 1977 at 81 and left office at 83 two years later. 2. Dr.ManmohanSingh took over as the PM when he was 72.He would be 82 if he continues in office till 2014.Shri AtalBehari Vajpayee took over as the Prime Minister when he was 74 and left office at 80 after the defeat of his party in the elections of 2004. If the BJP had been returned to power in the 2004 elections, he might have continued as the PM till the age of 85. 3.Rajiv Gandhi was the youngest Prime Minister in the history of independent India. He became Prime Minister when he was 40 and left office at 45 after his Congress Party lost the elections of 1989. His mother Indira Gandhi was the second youngest Prime Minister in the history of independent India. She became the PM at the age of 49 and was assassinated when she was 67 in 1984. For three years between 1977 and 1980, she was in political wilderness. The remaining years between 1966 and 1984, she was in office as the Prime Minister. The other Prime Ministers of India were in office between 50 and 70 years of age. 4. Till 1991, when NarasimhaRao, on being sworn in as the Prime Minister, inducted Dr.Manmohan Singh as the Finance Minister, he had served as a bureaucrat and not as a politician. He joined the Congress after taking over as the Finance Minister in 1991. He enjoyed the total trust of Rao and was totally loyal to Rao. 5.Rao gave him a free hand to re-shape the economy and he performed the task creditably. His success as the Finance Minister between 1991 and 1996 was due to the fact that he and Rao were on the same wave-length on the need for liberalising and modernising the economy. He did not have to hold any important post in the party in order to be successful as the Finance Minister. 6. When he took over as the Prime Minister in 2004 at the request of Mrs.Sonia Gandhi, Dr.Manmohan Singh faced many handicaps due to the fact that he had never held any post in the party and people like ShriPranab Mukherjee under whom he had worked as a bureaucrat were now required to work under him as the Prime Minister. Initially, this created uneasy personal equations but he managed to get over them. Another major difficulty faced by him arose from the fact that the primary loyalty of the Ministers from the Congress in his Council of Ministers was to Mrs.Sonia Gandhi and not to him. There was and there still is no Minister whose primary loyalty is to Dr.Manmohan Singh. 7. During his first tenure as the Prime Minister, the country faced some major internal security problems. The Maoist insurgents spread their area of operations over large tracts of Central India. There was a major act of mass casualty terrorism carried out by Pakistan-sponsored jihadi terrorists in the suburban trains of Mumbai in July 2006. There were many acts of jihadi terrorism by the Indian Mujahideen in different cities of India in 2007 and 2008. There was a three-day commando-style attack on different targets in Mumbai between November 26 and 29,2008, by sea-borne terrorists of the Lashkar-e-Toiba (LET). 8. Despite the deterioration in the internal security situation during his first tenure in the rest of India, the situation in Jammu and Kashmir registered a qualitative improvement with new ideas for finding a solution to the Kashmir problem with Pakistan being discussed with positive results through back channels with the regime of Gen.Pervez Musharraf in Pakistan. If the terrorism situation in Punjab improved and normalcy was restored when NarasimhaRao was the Prime Minister, the situation in J&K improved under Dr.Manmohan Singh for which credit has to be given to him. 9. Under the management of ShriP.Chidambaram as the Finance Minister, the economy registered considerable improvement and India was taken as seriously as China in the economic decision-making circles of the world. Dr.Manmohan Singh along with President Hu Jintao of China was invited to the head table in all economic summits. Chindia became a much used expression in characterising the economic race between India and China. 10. Foreign policy was another major area of success between 2004 and 2009, with India and the US coming closer together and with India's relations with China showing improvement despite the suspicions caused in Bejing by the Indo-US strategic partnership and the initiatives taken by the Manmohan Singh Government for improving relations with Singapore, Vietnam, Japan, South Korea and Australia. 11. During this period, Dr.Manmohan Singh was only Prime Minister by half with much of political authority and prominence remaining in the hands of Mrs.Sonia Gandhi. Despite this, his visible and palpable record was positive. 12. At the same time, a huge iceberg of corruption, nepotism, crony governance and favouritism was gathering shape and strength under his administration. His reluctance and inability to control the Ministers from the coalition partners under the pretext of coalition dharma or coalition compulsions contributed to the formation of this iceberg.The tip of this iceberg was seen in 2010 in the so-called Radia tapes which brought out the enormous political influence that an apparently mediocre person had been able to acquire over the decision and opinion-making process by taking advantage of the permissive atmosphere that prevailed. The iceberg hit the Government in 2011---with one scam after another, with one irregularity after another and with one wrong-doing after another denting the credibility of the Prime Minister. 13.But even before the iceberg hit the Indian ship, one could see the gathering storm and darkening clouds from different directions. The shifting of Shri Chidambaram from the Finance Ministry to the Home Ministry after the 26/11 terrorist strikes improved our internal security management, but considerably weakened our economic management. This weakening of the economic management took place at a time of the global economic melt-down. India came to be seen less and less as a success story and more and more as a stalling economy. References to Chindia disappeared from debates in international financial circles. 14. The crisis and the drift called for strong leadership that came to be missing. The duality of control between Mrs.Sonia Gandhi and the Prime Minister added to the gravity of the drift. Instead of admitting the gravity of the iceberg that had hit the State and his Government and trying to bring the ship back under control, Dr.Manmohan Singh and his Ministers tried to deny the presence of the iceberg. 15. Only now, there has been a belated realisation that India is adrift and needs a strong and decisive leadership to bring it back on the route of progress and development. One has to welcome the hard economic decisions already taken by the Government and the support that the Prime Minister has received from his party for those decisions. As I had pointed out in an earlier article, this is only the beginning. More hard decisions are required not only in the field of economy, but also in respect of administrative reforms to deal with corruption and to improve further the national security machinery. 16. It is time for the Prime Minister to convince the people that those decisions will be forthcoming and will be implemented even if they lead to early elections and the possibility of a defeat for his party.Dr.Manmohan Singh has less than two years left in office. He can still salvage his reputation and that of his Government and party by doing all that needs to be done to restore the confidence of the people. 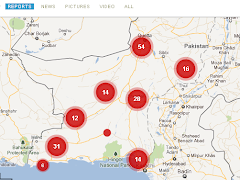 Monitoring events in Balochistan, CPEC (China Pakistan Economic Corridor), China's Belt and Road Initiative and it's economic and strategic implications, Pakistan Military operations and ongoing Baloch struggle.News and Reports are collected from open sources to raise awareness among scholars, researchers and public in general. How Chanda Kochhar managed 2008 crisis ? Is Patriotism dead in India? The views, opinions, positions or strategies expressed by the authors and those providing comments are theirs alone, and do not necessarily reflect the views, opinions, positions or strategies of IntelliBriefs or any employee thereof. IntelliBriefs make no representations as to accuracy, completeness, currentness, suitability, or validity of any information on this blog and will not be liable for any errors, omissions, or delays in this information or any losses, injuries, or damages arising from its display or use.